Home News Translink festive travel package revealed. Translink festive travel package revealed. Translink has announced its festive travel package for Causeway Coast and Glens residents. Whether it’s for shopping or festive celebrations, Translink customers can make the smart move and enjoy extended services and discount fares to make their all-important journeys over the Christmas period. NI Railway passengers can enjoy a third-off day returns after 9.30am and all day at weekends, with free returns on Goldline and Ulsterbus services also available until the end of December. Ulsterbus customers can also enjoy £2 all-day travel offer across town services from 9.30am throughout the busy month of December. Rail monthly ticket customers can enjoy 25% discount on tickets purchased between now and 7 December 2018. For late night shoppers or celebratory nights-out, late night rail services will be operating on all lines around midnight on Friday and Saturday nights from 1st December – 22nd December. Translink’s popular Bus Rambler ticket (£9) which offers unlimited bus travel across NI will be available every day from 15th December to 1st January for people who want to make the most of their days out over the festive period. For groups exploring winter wonderlands across NI, Translink’s Family and Friends ticket offers one day’s unlimited travel for up to two adults and four children across all services on weekdays after 9.30am and there’s no time restriction on Saturdays and Sundays until 1st January 2019 for the reduced fare of £18. Full details are available online at www.translink.co.uk/christmas/. “We know Christmas can be a busy and expensive time which is why we are delighted to reduce costs across our services for customers to enjoy affordable hassle-free travel over the festive period and help keep costs down. “We look forward to welcoming our customers on board services this Christmas supporting the local retail and hospitality sector at this important time of year,” continued Sam. Not only is Translink offering customers the gift of great value travel, there’s also a range of special activities planned to ‘give back’ during the season of goodwill. “We do our best every year to bring the Christmas spirit to life in our stations and on-board services. This year we’re calling on everyone to help us fill a Double Decker bus full of children’s toys in aid of St. Vincent De Paul and the Salvation Army. In partnership with U105 Radio, we’ve launched our ‘Stuff A Bus’ Toy Appeal which is now in its second year and would encourage Causeway Coast and Glens residents to keep an eye out for drop-off points in selected stations. We would like to thank our customers for all their support and wish them a very Happy Christmas,” said Sam. 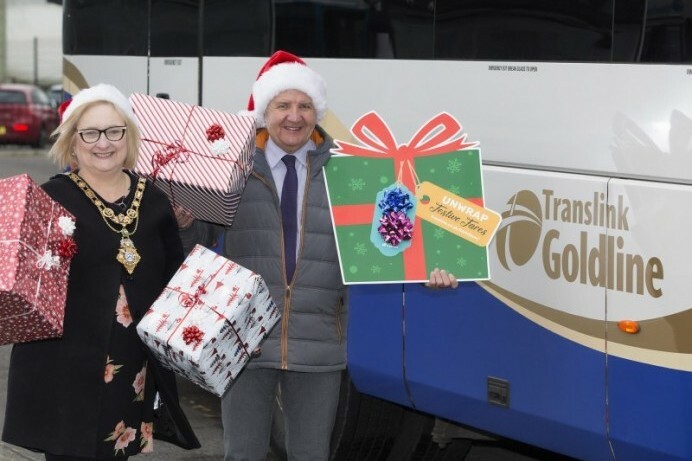 “Speaking at the launch of Translink’s 2018 festive travel campaign, The Mayor of Causeway Coast and Glens Borough Council, Councillor Brenda Chivers encouraged people to take public transport saying: "We recognise the great lengths Translink goes to in order to make these services and offers available and would encourage everyone to make the smart move and choose public transport when travelling to local shops and attractions this season. For full details on Translink’s Christmas travel offers, services and festive celebrations visit www.translink.co.uk/christmas/ and join in the online conversation @Translink_NI #smartmovers. Pictured unwrapping the festive travel package for Causeway Coast and Glens residents are Translink’s Sam Todd and The Mayor of Causeway Coast and Glens Borough Council, Councillor Brenda Chivers. Featuring major fare discounts, additional late-night services plus some festive surprises, it will ensure local shoppers and commuters can make their all-important journeys this Christmas. For full details on Translink’s Christmas travel offers, timetable and entertainment activities visit www.translink.co.uk/christmas/.